Fold the seat and tiller down. Normally one of the armrests (sometimes both) need to be removed for using the hoist. Sometimes the scooter seat may need removing. 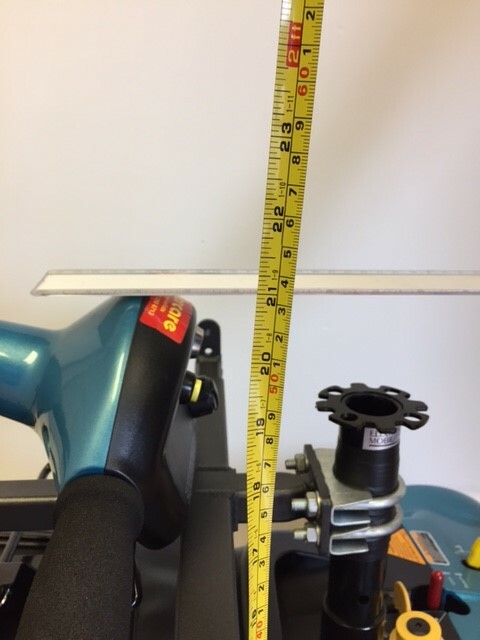 Measure from the floor to the highest point (see image 1).The point you are measuring to is vertically above the point where we will fit a scooter lifting bracket. (The bracket is fitted at the centre of gravity of the scooter which is approximately 3″ – 4″ in front of the seat post). The height to the top of the tiller is sometimes an important dimension as well so it is advisable to take this measurement as well. Measure the scooter height at the centre of gravity (see image 2). This is where we fit a lifting bracket to the scooter. Usually the seat is folded forwards and the tiller folded down. It is necessary to add on about 4 or 5 inches (100mm – 125mm) for the hoist lifting arm. The total height of the scooter must be less than the height of the boot aperture. Please ask if in any doubt. If you wish to lift your scooter into the car without removing the scooter seat then “MPV” type estate cars are often the best choice. This is because the height of the boot opening aperture is greater than in standard estate cars. Good choices for hoists are Vauxhall Zafira, Renault Scenic, Ford Galaxy and Ford C-Max, also Ford Tourneo, Citroen Berlingo or Peugeot Partner. The size of the car required obviously depends on the size of the scooter. Sometimes it will be necessary to fold some of the seats down to make room for the scooter. In a seven seater car you may lose the seventh seat in fitting a hoist but the other seats will be available when the scooter is not in the boot. For specific cars it is best to refer to us on this matter. 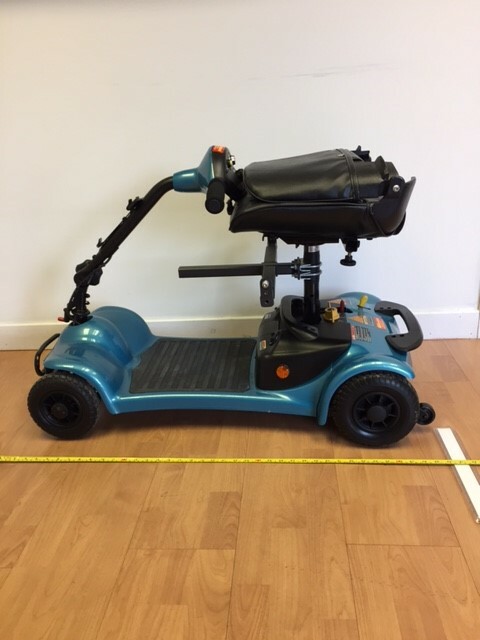 If you know the make and model of the scooter we may already have experience of lifting it into a car for a previous customer. 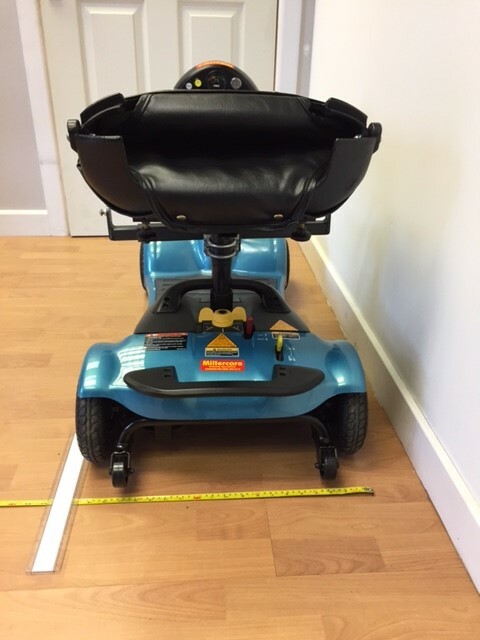 Measure the scooter length as shown (see image 3). Sometimes the scooter can go sideways in the boot but for longer scooters it may need to go lengthways or diagonally. Ensure that you have enough space in the boot for passengers, luggage, etc. Please ask us if you are unsure. 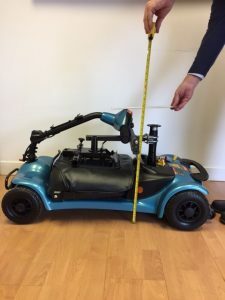 Please also measure the width of the scooter (see image 4). Note – The weight of the scooter is also needed when considering which hoist to fit. We fit 40kg, 80kg, 100kg, 150kg and 200kg hoists. Following these guidelines should ensure that your scooter fits successfully into your car, with your choice of hoist. Should you require any further help or assistance please do not hesitate to contact the office on 0161 776 1594 or alternatively you can contact us via email on office@basnw.co.uk.